Welcome to the Simon Fraser University Choir! We are a not-for-profit organization of students and community members who sing together once a week at the SFU Burnaby campus. Our choir was founded in 1992. Since its beginnings, the choir has grown from a small group, to a membership of 75-100 singers. We welcome people from all different backgrounds, from people with little music experience, to those who have been performing their entire life. This club brings musicians together. Along with making a wide variety of music--from Game of Thrones, to African music, to full-fledged Requiem mass--we also make many lasting friendships. We make an effort to welcome new members into our group and provide many opportunities to socialize. 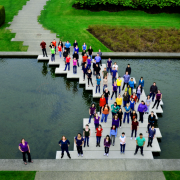 In 2015, we added a subsidiary to our choir: the SFU Chamber Choir. This group is smaller, with a limited capacity of usually 16 singers. The SFU Chamber Choir is a more professional group which requires an audition. [You can sign up for an audition here]. Anyone may join one, or both choirs. Is the SFU Choir for you? Click “Look & Listen” to check out past performances. First rehearsal for the SFU Choir will be at Images Theatre on Thursday, September 14th at 5:30pm. Just bring yourself and a pencil, and take the opportunity to meet the group and learn more about the choir, or click “Join Us!” for details on upcoming rehearsals and other need-to-know information.